Out to sea for months at a time, navy ships don’t just glide back to port when a system goes down. System failure is not an option when reliability is mission critical. In 1997, General Dynamics Canada was selected as Prime Contractor, System Designer, and System Integrator for an underwater suite of the Swedish Visby Class corvettes. The underwater system, HYDRA, performs anti-submarine warfare and mine hunting missions, both in the open ocean as well as in the Baltic Sea, one of the more acoustically difficult waters of the world. 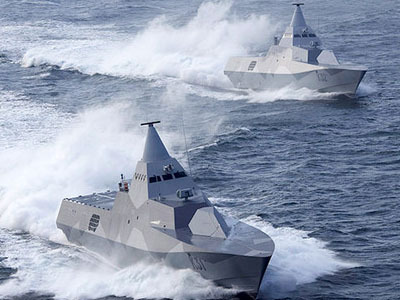 The Visby corvettes, a specialized class of naval warships characterized by their small size and fast speed, are internationally known for their stealth and robust use of advanced information technology. General Dynamics Canada is a leading worldwide supplier of innovative solutions for land, airborne and maritime applications whose global success stems from their strong system engineering experience. GD Canada carefully assembled the team of products to embed into HYDRA, realizing that each individual component was important to the overall health and success of the entire system onboard Visby corvettes. When it came to data management software, engineers at GD Canada sought the proven, advanced technology of the embedded database specialists of Empress Software. Empress Embedded Database is a field-tested solution that runs flawlessly in thousands of embedded systems worldwide. Rich in features, impressive in performance, and rock solid in reliability, Empress Embedded Database is the database of choice for diverse embedded applications including data acquisition & instrumentation, networking & telecom, control & automation, automotive, security, and military & defense. The new capabilities developed by General Dynamics Canada will allow higher levels of systems integration that are no longer limited to sonars, but can also include radar, electronic warfare systems, and other sensors, suitable to fit any platform. * See an example of Empress Embedded Database performance for yourself in Empress Live DB. Empress Live DB runs reliably, even faster, and without any maintenance since it was first set off in 2005.